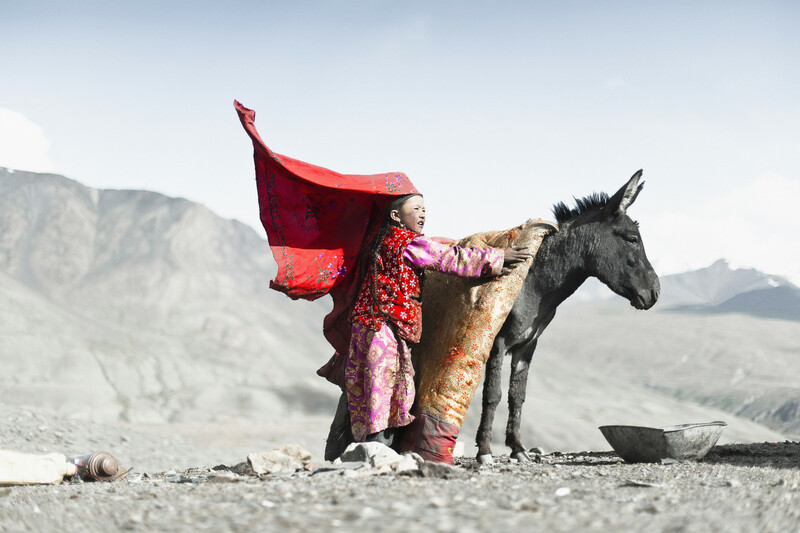 Marbet, a young Kyrgyz girl, is saddling her donkey to go to school. She lives on the rooftop of the world, at 4,500m in the remote Wakhan Corridor in northeastern Afghanistan where a declining population of 1,103 Kyrgyz of Mongolian and Turkic origins still live a traditional lifestyle, eking out their existence as nomadic herders. I shot this image, featured on the homepage of the National Geographic website for several weeks back in 2012, when a friend and I decided to embark on a journey of discovery in the Wakhan Corridor . The 300 km (approx. 186 mi.) long Wakhan Corridor, located in north-eastern Afghanistan bordering China, Tajikistan and Pakistan, is considered one of the most remote and difficult to access regions in this part of the world. Populated by two peoples, the Wakhi and the Kyrgyz live in peaceful coexistence while both trying to survive in a great expanse where the altitude and lack of resources render it practically uninhabitable. A Turkic/Mongol people, speaking a branch of the eastern Turkish tongue, the Kyrgyz still lead a nomadic lifestyle and are led by a khan or tekin. Their seasonal settlements of yurts spread across the furthest and highest reaches of the Corridor. What we discovered during those weeks of treks is an « untouched » Afghanistan where the values of sharing, welcoming and brotherhood remains the one inspired by the books of Jospeh Kessel and Nicolas Bouvier. All through our journey, we share their life of hardship, their diet of low-calorie bread, tea, yak milk, and, rarely, small quantities of rice. Every encounter reminds us of the contrast between our Western lives and the precarity of theirs, where life expectancy stops short at 50 and where infant mortality verges on 60% - the highest in the world. But we are also confronted by many contradictions. Living on the highest plateaus, far from any village, in a constant state of precarity where finding a potato or a piece of fruit is three-week walk away, we find solar panels, satellite aerials, television sets, and an impressive array of batteries, cables, and chargers. We ask ourselves what will we share upon our return? What have we learned? So, it is with profound humility that I have chosen to share these images with you in the hope that they reveal enduring, proud, and peaceful portraits Kyrgyz people you will make yours.